Color Changing: Blue, red, yellow, cyan, purple, green, white, can fixed one color or 7 color gradual turnning. Any problem please feel free to contact us first so that we can Offer the best service for you. 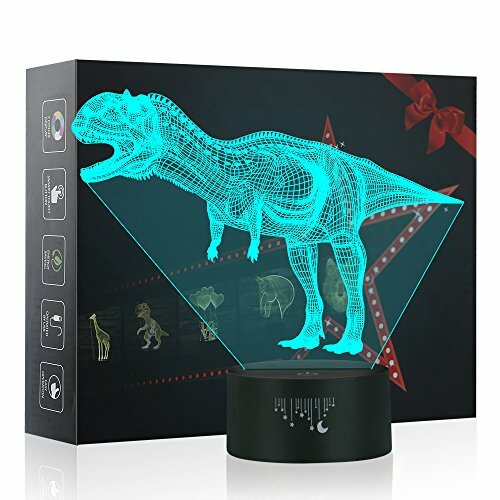 3D visual shape creative lamp?3D just Visual, the lamp itself is Flat !? is an innovative artistic atmosphere light, optical acrylic light guide plate engraving a variety of 2D graphics, 3D visual impact. Unique lighting effects amazing optical visual illusion home decor lamp, It makes your room more interesting. Smart Touch Change: Red - green - blue - yellow - cyan - pink - white - all color flashing in turn. touch button to toggle between different color or the flashing colors mode, will meet your different needs. Compatible with any USB power port, such as Laptop, Computer, USB Power Bank, USB Power Adapter, and any other with USB Connector. Safety Night Light, eco-friendly acrylic material, LED light source, environmental protection, hurtless to the eyes. Two Modes--First Mode: get the exact color you want, by taping the smart touch switch one by one; Second Mode: 7 Kinds of colors flash circularly themselves. Creative lamp makes the perfect as a festival, birthday gift for kids, adults, families, boyfriend, girlfriend and loves. Just go ahead and light up your life. Nice Present for christmas, birthday, advertising promotional, holiday, tourist attractions. Nice decoration for bedroom, child room, living room, bar, shop, cafe, restaurant, office, wedding, parties and restaurant atmosphere,restaurant, study, living room, bar, shops, etc. as decorative lights. If you have any questions about this product by Rquite, contact us by completing and submitting the form below. If you are looking for a specif part number, please include it with your message.